Earth is on the brink of ruin. Great storms destroy cities. Rising seas reshape the continents. Afraid for its survival, mankind constructs a fleet of space stations in orbit, and steps off-world. Among the humans fighting for their future are Micah Sparrow, a widower who uncovers a plot to return mankind to the dark ages; Tasneem Kyoh, who undergoes life-extension treatments and begins the search for humanity's next home; and David Dewbury, a prodigy who believes he knows where that home might be. But in space, the rules aren't the only things that have changed. Man himself has changed, and with the Earth in tatters behind him, man turns his attention to the one thing left to destroy: himself. 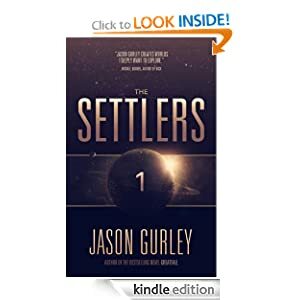 The Settlers is the explosive first book in Jason Gurley's Movement Trilogy, the epic story of man's small step into space, and the great leaps humanity must make to save its own future.